I like to call this the week of the Irish when we celebrate our Irish hertiage. We love having special family recipes on our meal plan and remembering some of the wonderful family celebrations that we have had to celebrate our Irish hertiage. Our weather has been so nice, the work on our new screen porch is almost finished and I can hardly wait to enjoy the new porch. I am hoping that we will get to have our meal on St. Patricks day on the new screen porch. I made the cabbage stew in the crock pot the other day. This is now our new favorite meal! Thank you for a great dinner idea... it makes LOTS too! I look forward to having it again! 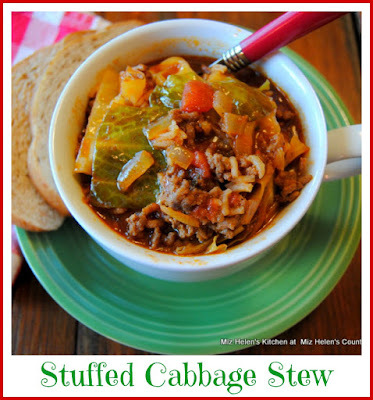 I am so excited that you like the Cabbage Stew, our family just love that stew. Thanks so much for stopping by and sharing with us and hope you have a fantastic day! 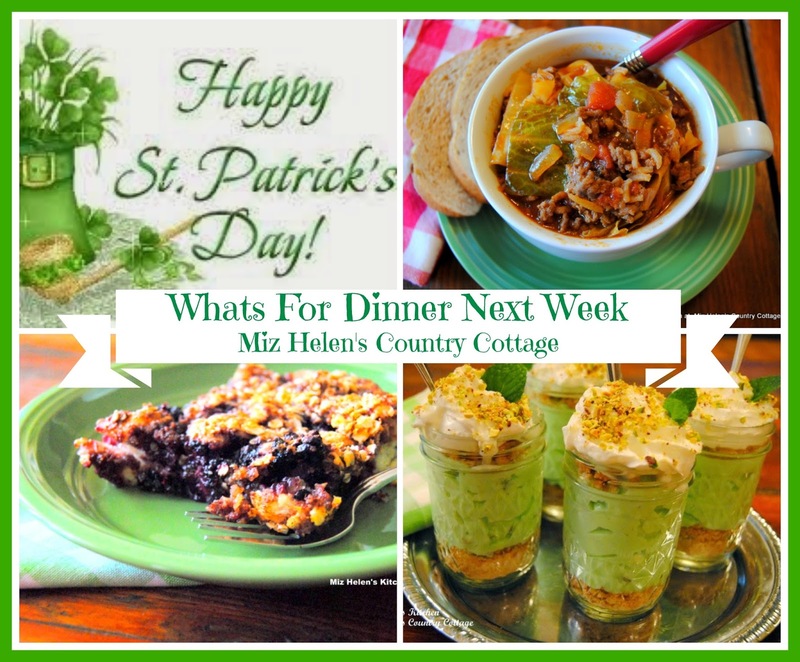 Looks like you will be celebrating St. Pats all week Miz Helen! My granddaughter's birthday is St. Pat's day, so we will be celebrating with cake! Happy Birthday to your Granddaughter, I am sure it will be a very special celebration! Thanks for stopping by and have a great week! It all looks so good - but that ruben burger...yum!! Thanks for sharing on the What's for Dinner link up! Our family loves that Ruben Burger and I sure hope you enjoy it! Thanks for stopping by and have a great week! That blackberry crumble cake looks delicious! Blackberries are a favorite of mine. We love that blackberry crumble cake and it is even better when we get the berries from our own bush. I checked out your 1950's Style Menu Week and it is just awesome! Oh Miz Helen, your menu plans always look so delicious! I really need to try that yummy Pistachio Dessert and the Irish Blackberry Crumble Cake looks amazing too. Thank you so much for sharing with us at Hearth and Soul. Pinned! 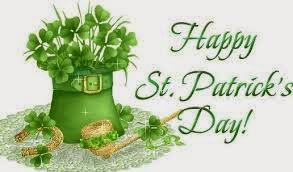 I hope you had a wonderful St Patrick's Day.